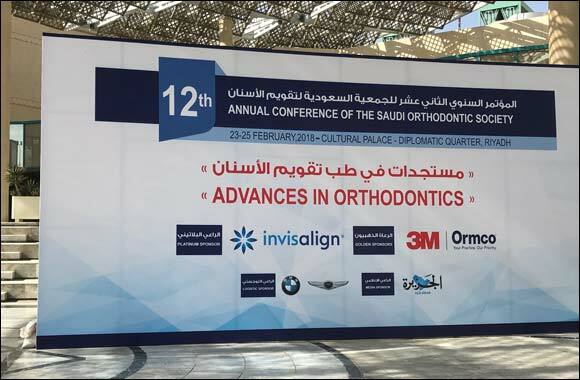 25th February 2018: Invisalign MEA DMCC, a subsidiary of Align Technology, Inc. (NASDAQ: ALGN) and provider of the leading Invisalign clear aligner brand, announced its platinum sponsorship of the 12th Annual Conference of the Saudi Orthodontic Society (SOS). As one of the leading dentistry events in the Middle East, the conference is taking place between 23rd and 25th February 2018 at the Cultural Palace, Diplomatic Quarter in Riyadh, the Kingdom of Saudi Arabia. The 12th edition of SOS focusses on the advancements that are being made in orthodontics and shine a spotlight on the potential opportunities in an industry that is set to reach $309 million by 2021, according to Market Data Forecast. Various discussions over the three-day event will concentrate on the technological, operational and medical evolutions taking place in the dental sector led by some of the industry’s leading practitioners. The Invisalign system is a combination of proprietary virtual modeling software, rapid manufacturing processes and mass customization, and virtually clear, removable appliances or aligners that are used to straighten teeth. The Invisalign system is prescribed to patients through Invisalign-trained orthodontists or general practitioner dentists (GP dentists). Used to treat a wide range of clinical situations, Invisalign treatment options address simple to complex cases and post-treatment retention. For additional information about the Invisalign system or to find an Invisalign provider in your area, please visit www.invisalign.com.sa. For additional information about the iTero digital scanning system, please visit www.itero.com.